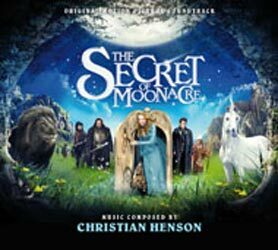 Christian Henson's score for The Secret of Moonacre is a joy from start to finish. A beautifully crafted orchestral work that is practically a master class in how to compose the perfect, emotive score. Critics always state that you should never notice the music in a movie if it's well composed - that it shouldn't take over the film. I take issue with that rather out dated opinion. There's no doubt that Henson's music is an entity in its own right and, as such, deserves to be noticed while you're watching the film. It's as much a part of the movie as the actors are. The first time I heard Henson's work was when I watched the TV series Lost in Austen. While his music for that was a little over powering, it was still incredibly moving stuff. The Secret of Moonacre gives us more of the same. There's no subtlety here - no dull background mood music. Henson beats the listener over the head with his themes but, to my mind, that's part of the charm of his musical styles (and he has many). The album opens with 'Opening Titles' - a grand, and moving theme that gives way to a mellow, haunting track. This easy shift between two very different styles is something that is typical of the rest of the album. From the calmness of 'The Two Moon Princesses' to the heart pumping chase music of 'Into the Forest' Henson leans on every emotional button there is. There's comedy themes ('Marmaduke Scarlett'), eerie mood music ('Running from Moonacre' / 'Maria is Captured'); and a great vocal track ('Stars') sung by Skye. I noticed quite a few influences amongst this album's themes - most notably Danny Elfman ('Into the Book' and 'The 5,000th Moon') and was that a whiff of Trevor Jones's music for The Dark Crystal at the start of "All's Well That Ends Well"? I even caught a flavour of Jerry Goldsmith's music for Gremlins in 'Robin Attacks / Arrival at Moonacre'. Over the album's 1 hr, 4 mins (split over 26 tracks) worth of music there's something to cover all emotional styles.